When designing infrastructure projects, CMT emphasizes energy efficiency to provide extra value to its clients. Now we’re taking a page from our own book by hooking up to the sun to power our headquarters in Springfield, IL. A solar energy system is being installed that is expected to provide approximately 90 percent of the electrical needs at the over 41,000 square-foot office building. “The project not only makes sense to our bottom line as a business, but also allows us to demonstrate leadership in applying sustainability and renewable energy. As leaders in the infrastructure design world, this really makes sense,” said Dan Meckes, CMT president and CEO. 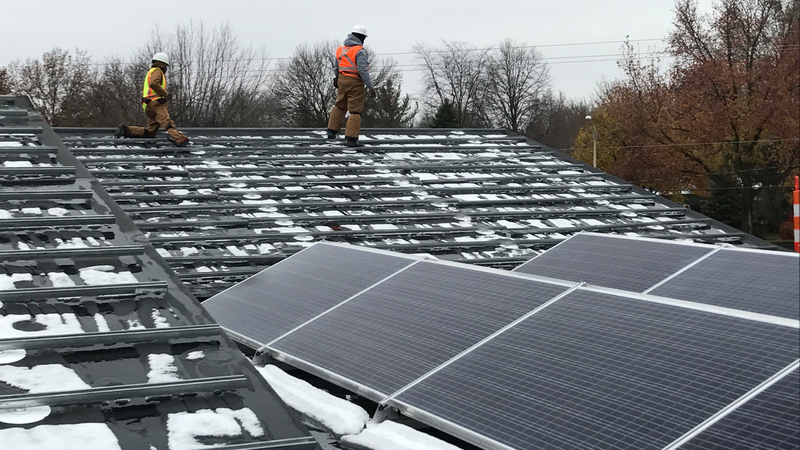 The 393.68 KWP solar system is being designed by WCP Solar Services of Naperville, IL. Roughly a third of the power will be supplied by solar panels that are being installed on the building’s rooftop. A unique feature of the project will be a carport solar system that takes advantage of the office’s parking lot space. This system will provide for the remaining capacity by using architecturally-enhanced, frameless thin film panels. According to WCP, the carport system is expected to be the largest of its kind in the country. In addition to providing for CMT’s energy needs, the system will also produce approximately 492 Renewable Solar Energy Credits each year. We are also benefitting from rebates and incentives being offered at the federal, state and local levels. WCP Solar has designed, engineered and is installing a 393.68kWp carport and rooftop solar system combo. WCP Solar is employing local contractors and employees to complete and commission this solar system. These businesses include, O’Shea Builders, API Solar, Selvaggio Steel, B&B Electric, and J.K. Snyder Company. Read more about CMT’s big solar project in this article from the State Journal-Register.